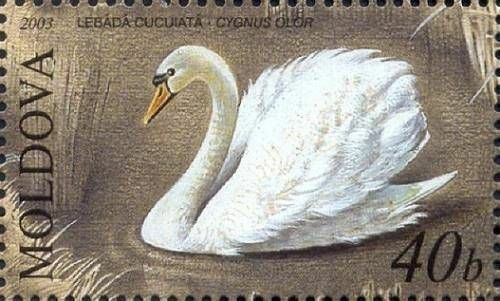 On 18 December 2003, the Post Office of Moldova (Poșta Moldovei) issued a series of postage stamps with the title The Red List of Moldova - Birds. The issue comprises four stamps, one on a souvenir sheet, with associated cancellation (postmark) and first day covers (FDC). The designer was Vladimir Melnic. The printing was performed by Cartor Security Printing, France. The Mute Swan (Cygnus olor) is a species of swan, and thus a member of the waterfowl family Anatidae. It is native to much of Europe and Asia, and (as a rare winter visitor) the far north of Africa. It is also an introduced species in North America, Australasia and southern Africa. The name 'mute' derives from it being less vocal than other swan species. Measuring 125 to 170 cm (49 to 67 in) in length, this large swan is wholly white in plumage with an orange bill bordered with black. It is recognisable by its pronounced knob atop the bill. Read more.. This article uses material from the Wikipedia article 'Mute_Swan', which is released under the Creative Commons Attribution-Share-Alike License 3.0. The Great Egret (Ardea alba) also known as Common Egret, Large Egret or Great White Heron, is a large, widely distributed egret. Distributed across most of the tropical and warmer temperate regions of the world, in southern Europe it is rather localized. In North America it is more widely distributed, and it is ubiquitous across the Sun Belt of the United States and in the Neotropics. The Old World population is often referred to as the Great White Egret. This species is sometimes confused with the Great White Heron of the Caribbean, which is a white morph of the closely related Great Blue Heron (A. herodias). Read more.. 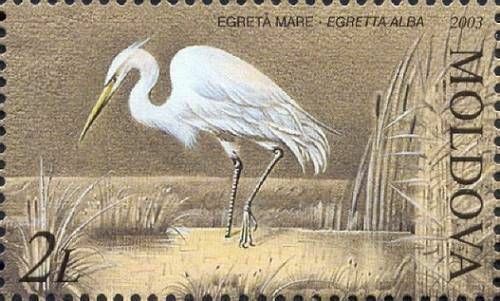 This article uses material from the Wikipedia article 'Great_Egret', which is released under the Creative Commons Attribution-Share-Alike License 3.0. 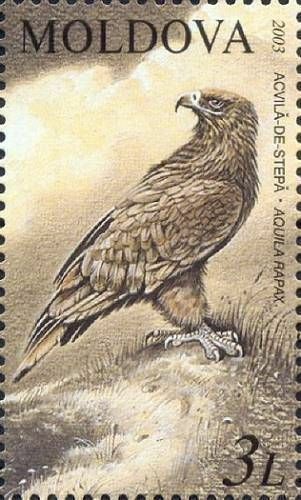 The Steppe Eagle (Aquila nipalensis) is a bird of prey. It is about 62–81 cm (24–32 in) in length and has a wingspan of 1.65–2.15 m (5.4–7.1 ft). Females, weighing 2.3–4.9 kg (5–10.8 lbs), are slightly larger than males, at 2–3.5 kg (4.4–7.7 lbs). Like all eagles, it belongs to the family Accipitridae. It was once considered to be closely related to the non-migratory Tawny Eagle (Aquila rapax) and the two forms have previously been treated as conspecific. They were split based on pronounced differences in morphology and anatomy (Clark, 1992; Olson, 1994; Sangsteret al., 2002); two molecular studies, each based on a very small number of genes, indicate that the species are distinct but disagree over how closely related they are. Read more.. This article uses material from the Wikipedia article 'Steppe_Eagle', which is released under the Creative Commons Attribution-Share-Alike License 3.0. 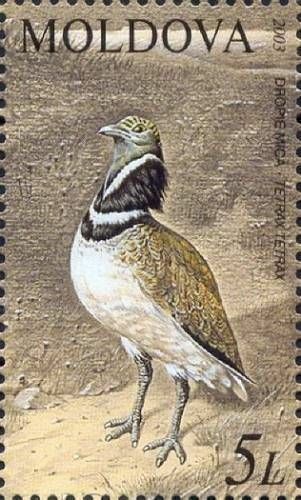 The Little Bustard (Tetrax tetrax) is a large bird in the bustard family, the only member of the genus Tetrax. It breeds in southern Europe and in western and central Asia. Southernmost European birds are mainly resident, but other populations migrate further south in winter. The central European population once breeding in the grassland of Hungary went extinct several decades ago. Read more.. This article uses material from the Wikipedia article 'Little_Bustard', which is released under the Creative Commons Attribution-Share-Alike License 3.0.